Clematis roots and vines are fragile and don't recover well from rough treatment, so handle the plant gently. If your plant has a tiny trellis in its nursery pot, keep it in place and have someone help you hold it up as you remove the pot; otherwise, the trellis can flop over and damage the plant. Dig a hole double the width of the root ball, placing the plant no deeper than soil level. Add a larger trellis right away so the plant has something to grab and grow up. Water as it gets established the first few years, but clematis doesn't like it too dry or too soggy. Feed once a season in early spring after the ground thaws with a general-purpose fertilizer. As the plant matures, prune to eliminate scraggly stems. But because different varieties bloom at different times, read the label or look up your variety online for proper pruning times. In general, if a plant blooms in early spring, prune it right after that. Summer blooms mean it blooms on new wood, so prune to about 18 inches above ground in very early spring. When in doubt, wait a season and record your observances before snipping. 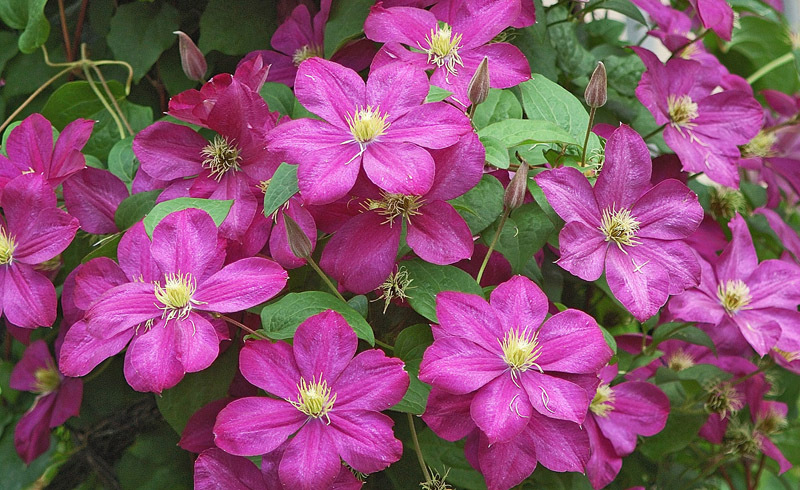 Can you grow clematis in a pot? Yes, but choose a large pot and a clematis that can tolerate one zone hardier than where you live so it survives the winter. For example, choose a zone 4 plant if you live in zone 5. Also, plant it by itself in the pot because it doesn't compete well with other plants. How long does it take to grow a clematis? Clematis is perennial so it comes back every year. But be patient! The first year it may appear that there's not much going on. Your clematis needs at least two to three years to flourish because its complex root system takes time to establish. Will a clematis climb by itself? Yes and no. The plant climbs by wrapping its leaf stems around a structure, but it doesn't like anything that's more than about ½" in diameter to grab. For example, it cannot climb up a solid mailbox post or light pole. You need to give it a little help by attaching netting, fishing line, or twine to a standard trellis. The more options you give it to grab, the better it climbs. 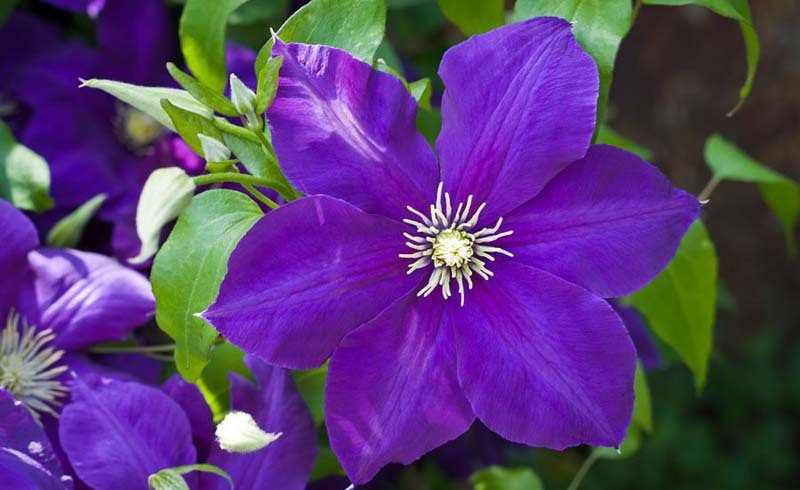 GROWER TIP: "The classic advice for clematis is that it likes its feet in the shade and head in the sun," says Stacey Hirvela, horticulturalist for Proven Winners Color Choice Shrubs. "Keep the root zone cooler with mulch, a neighboring plant like a day lily or juniper, or even a rock. Make sure the top of the plant gets at least six hours of sun."